Cool jazz. The complexity shifts to composition. Jazz isn't just revamped show tunes anymore; composers are writing new music especially for jazz. It's serious stuff now, and when John Lewis and the Modern Jazz Quartet perform, they wear tuxedoes. In our weekly class at MacPhail, Kelly Rossum plays selections from Birth of the Cool, which has to be one of the all-time great titles for a jazz recording. We wonder if the title came from the artists or from the label. The CD includes the entire recorded output of the Miles Davis Nonet, a short-lived supergroup that included Davis on trumpet, J.J. Johnson on trombone, Lee Konitz on alto saxophone, Gerry Mulligan on bari saxophone, John Lewis on piano, and Max Roach on drums. It's more relaxed than bebop, more spare, more...cool. Kelly says that cool was a reaction to big band, and cool composition a reaction to swing. We talk briefly about third stream, a term coined in the late 1950s by Gunther Schuller to describe a synthesis of classical music and jazz. Kelly isn't convinced that third stream has ever really worked, but I like where it has led: the Modern Jazz Quartet's Blues on Bach; John Lewis's jazz interpretations of the Goldberg Variations (The Chess Game) and the Preludes and Fugues; Jacques Loussier's many jazz interpretations not only of Bach but also of Chopin, Ravel, Mozart, Beethoven, Handel, Vivaldi, and Satie. The class is just an hour long, so we move quickly to the West Coast, Chet Baker, Gerry Mulligan (mellower and mellower); we hear Mulligan on "Line for Lyons," written for Jimmy Lyons, at the time a San Francisco DJ but soon after the founder of the Monterey Jazz Festival. Kelly likes to end each class by bringing us up to date with an example of how a particular style of jazz has survived and remains current. This time he plays "Laughing Barrel" by the Ron Miles Quartet, which includes the Twin Cities' own Anthony Cox on bass. The tune is one of Kelly's Top 10 favorites; the tone quality of all the instruments is very cool. Why does he like it? Because, he says, it's not in the book we're reading for class. 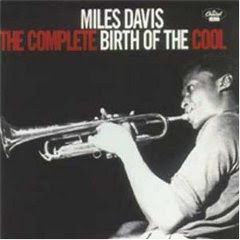 I read that the "Birth of Cool" title did come from the label and Miles is said to have disliked the "cool jazz" label. Thanks, Don. I'll share that with the class. Lisa Meyer and I had both wondered aloud about this.